It was a small step towards bridging what seems to be an ever-growing divide in the polarised post-9/11 world, where bomb blasts and security advisories have drastically reduced people-to-people contact between Americans and Pakistanis — opening a rift extremists can exploit. “While learning skills, the students also learn about world religions, human rights, democracy, all new concepts for them,” added Imtiaz, a tall woman with a calm demeanor. PEAD currently reaches 100 students between 14 and 18 years old, at four schools. The Christmas get-together, set in motion when some students said they wanted to celebrate Christmas “with foreigners,” was an unexpected outcome of the English Access Micro Scholarship Program launched by US State Department in collaboration with PEAD. It indicates the potential of “soft power,” a foreign policy concept based on the ability to attract and persuade, rather than use force and coercion, outlined by Harvard University professor Joseph Nye. Imtiaz is among the many Pakistani women who have long been working in their own ways to counter extremism. 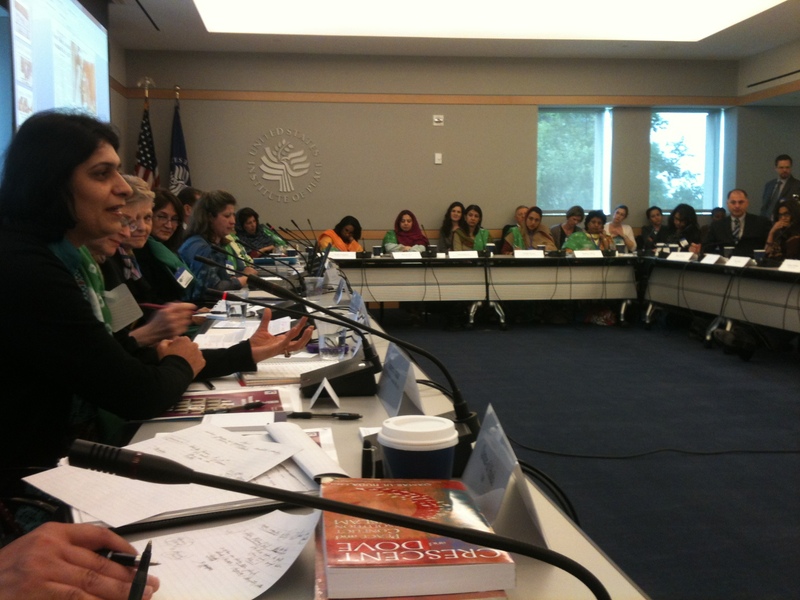 In April 2011, twenty such women came together in the Amn-o-Nisa (‘peace and women’) coalition, coordinated by Mosarrat Qadeem, a university professor-turned-activist. Qadeem’s soft-spoken demeanour disguises an iron will. She has since 2007 been involved in peace trainings in Peshawar, de-radicalising youth — and their mothers. The young men she was working with would return to their villages in Pakistan’s northern areas neighboring Afghanistan, then “come back and tell us about the problems there, boys being taken by the Taliban. So I said, ‘Okay, I’ll go back with you.’ I went and stayed at their homes, talked to their mothers,” she explained. These women have been working for years to uphold human rights, especially women’s rights that are the first to be threatened by rising extremism. Strategies like engaging with ‘the other’ and bridging divides through dialogue highlight the unique role that women can play in such situations. It’s no coincidence that the most ardent proponent of reconciliation in Pakistan was a woman, who paid for her politics with her life — former Prime Minister Benazir Bhutto, killed in 2008 while returning from an election campaign. The intervention diffused tensions and prevented violence from flaring up. Other districts hope to replicate this model. 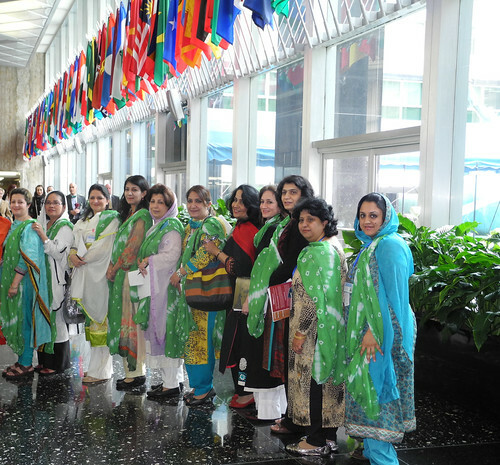 A dozen Amn-o-Nisa members are now in the US through a community outreach program of the US Embassy in Islamabad. Their three-week trip includes a week in Washington, DC where they met with policymakers and two weeks in other cities — New York, Chicago, San Diego and Los Angeles — where they are meeting activists to share best practices and experiences. In the Capital, their hectic schedule included meeting representatives of the National Counterterrorism Center, the Center for Strategic Counterterrorism Communications, the Department of Defense, the Department of State and various members of Congress. 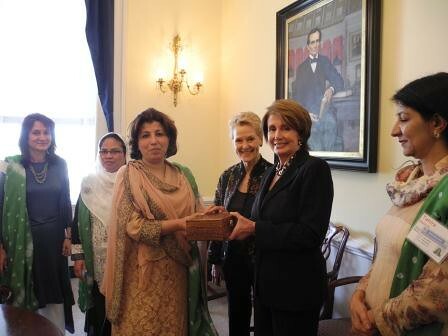 We’re not talking about women’s issues — it’s about Pakistan’s security, as House Democratic Leader Nancy Pelosi put it when she met them (she could have added America’s security and, indeed, the world’s). 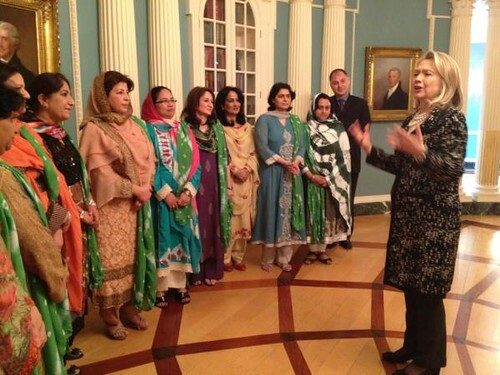 Amn-o-Nisa’s recommendations for the US government focus on advancing women’s inclusion in US counterterrorism efforts and increasing US engagement with Pakistani women peace-builders. “The society is often painted as patriarchal and under the influence of radical Muslim clerics who see no place for women’s participation in the public sphere. However, a group of Pakistani women from different walks of life … are challenging this perception through bold efforts in their country to counteract radicalization among young men,” says a report by Meridian, one of the co-sponsors of their visit. Pakistani women have been at the forefront of the struggle for democracy in a country that the military has ruled, directly or indirectly, for most of its 63 years, supported by external powers including the US. Now, several firsts indicate an ongoing process of change and some paradigm shifts. Pakistan’s first elected government after over a decade of military rule looks set to complete its tenure and hand over power to the next elected government — which will be a first in the country’s history. Washington has acknowledged its foreign policy mistakes of the past with regards to Pakistan — President Obama and Secretary Clinton have apologized for them. And the US is actively supporting the democratic political process in Pakistan, increasingly dealing with the elected civilian government and civil society rather than the military. When policy makers and journalists at home and abroad acknowledge such voices, it strengthens democracy and human rights. In the long run, this is what will roll back the tide of extremism, making the world a safer place. Soft power. Woman power.